In the late 1600s, the Earl of Burlington had acquired leasehold possession of Ten Acre Close, a piece of ground lying north and north-east of Burlington House. Richard Boyle, third Earl of Burlington (1694-1753), carried out the majority of the development of this estate between 1717 and 1739. Work was slow with numerous disputes over mortgages, leases and costs. New Burlington Street, which runs east-west from Savile Row to Regent Street, was the last street to be built on the estate ca.1735–39. Sadly, the only houses of whose building and history anything is known have been demolished. The street was intended, like other streets on the estate, for occupation principally by people of high social status and its first houses were similar to those on Savile Row. In the same way, the street included commercial premises as well; number 11, for instance, was first occupied by Robert Fisher, who ran Burlington Coffee House (or Fisher’s Coffee House) from the building. According to David Hughson’s Walks Through London, 1817, it was in New Burlington Street in 1763 that the practice of placing brass name-plates on doors first started. The idea then spread to Hanover Square and from there was generally adopted. In 1771, Sir Joseph Banks acquired a house in the street after his return from Captain James Cook’s first great voyage (1768–1771), during which he visited Brazil, Tahiti, and Australia. Banks was President of the Royal Society for over 40 years. Perhaps the most interesting house in the street was Number 5, which was first occupied by the Dowager Viscountess Irwin , a member of the Howard family and daughter of the third Earl of Carlisle, in 1735 or 1736. Its exterior conformed to that of its neighbours but its interior was one of the very few known to have been designed for a town house by Nicholas Hawksmoor. It was a late work undertaken only a year or so before his death in 1736. Between 1848 and 1869 the house was the headquarters of the Royal Asiatic Society. Although two houses on the north side, Nos. 1 and 2, are older than the rest they seem to have been the last in the street to have been built. Both were first leased on 5th June 1739, yet Nos. 8 and 9 were leased in September 1734 and Nos. 15 & 16 (opposite) were leased in September 1737. However, it is clear from early photographs that they are the much altered remains of the original development. No. 1 has been heightened by two storeys since 1836, its ground storey completely altered more recently and its brickwork given a red colour wash, but the top cornice remains and so do the continued sills on the first storey, although the windows have been lengthened. No. 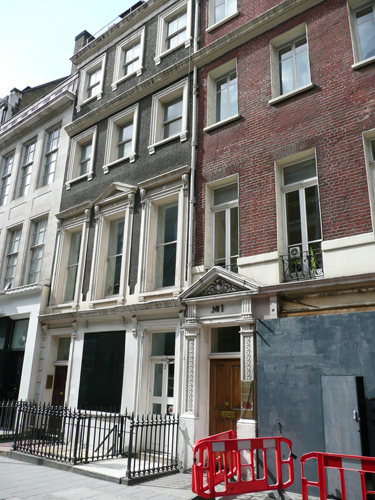 2 has been heightened by one storey (also since 1836) and its front resurfaced a dark grey, uniform dressings in cement having been added in early nineteenth-century style. The cornice survives, but there is no bandcourse nor continued sills above the ground storey. The architrave to the doorway of No. 2 is perhaps original but probably not the cornice or the consoles above. No. 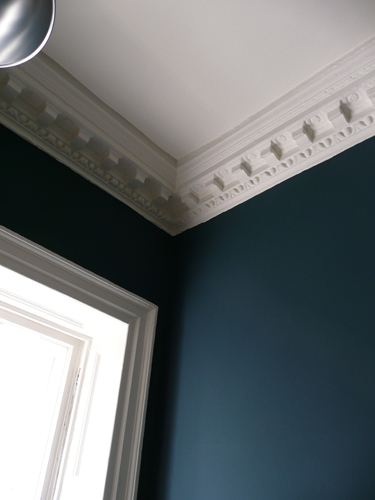 2: Cornice in First Floor Front Room. This proved to date from the ca.1930s. There is no evidence to suggest that any uniformity was enforced in the interiors of the houses. No. 1 has been entirely altered internally (probably in the 1830s), but at No. 2 some features are still distinguishable and these can be related to details given in an auctioneer’s notice of 1793. The first three floors each had two rooms, consisting of dining and breakfast parlours on the ground floor, drawing-rooms on the first (or principal) floor and bedrooms with closets on the second floor, the garrets being given over to three chambers for servants. A single staircase of stone served the whole building and existing evidence suggests that it was placed in the middle of the house with a room in front of and behind it. 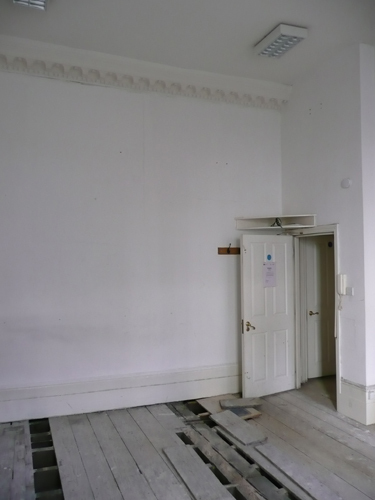 Complete original cornices remain in the entrance passage, the first floor rear room (it was thought, but proved not to be) and the second-floor front room, and part of one on the first-floor landing. The cornices are all enriched modillioned ones of plaster except for that on the second floor which, though apparently of plaster, resembles an enriched box-cornice. The housekeeper’s room, servants’ hall, kitchen and scullery were in the basement, and in the court-yard at the back was a detached stable building containing a double coach-house, stabling for six horses and accommodation for the coachman. Both houses are listed Grade II. No. 2: Cornice in First Floor Rear Room. I was asked to investigate the painted surfaces in both houses and was able to identify the early/original elements and to describe the sequence of colours employed since the 1730s. 1The map and much of the text has been taken from Survey of London. Vols 31 and 32, St James’s Westminster, part 2. Ed FHW Sheppard. 1963. 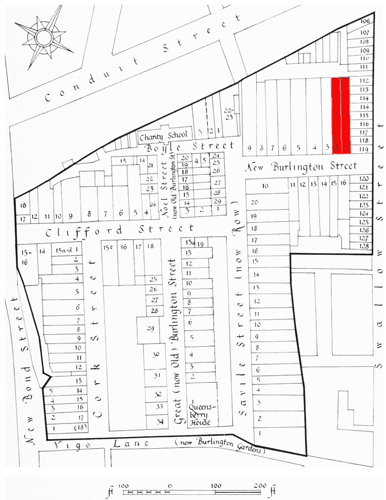 Chapter XXVI Cork Street and Savile Row Area: Ten Acre Close. Also Wikipedia.